Do you remember me? I’m the quilter who used to blog all the time. So where have I been? Ahhhhh, life. It does what it wants to do, and takes you places you’d rather not go. The last time I posted anything was on AUGUST 24, 2013. Since then, I lost my day job, but it was a true blessing. I won’t go into details, but we’ll just say that things were not all happy and glamorous prior to my leaving. I spent just under one month being unemployed. I think that’s pretty good! However, during that time, I also got to experience what people go through when they try and collect unemployment in the State of Michigan. It isn’t pretty, it isn’t fun, and I still have not collected a dime. The State of Michigan’s website – which you have to use to file for unemployment, report on your job search, and communicate with whoever works at the unemployment office – is the worst site I have ever used. It is not user-friendly at all, nobody gets back with you, it crashes all the time, etc. There is another option to call the office, but in all the hundreds of calls I made to the only phone number that they have, I never once got through to a human. What a pain! I applied for many different jobs during my few weeks of unemployment. I knew that the first job I applied for was the one I wanted. I was called in for an interview, asked to come in for a second, and knew I wanted the position. It was offered to me, and I must say, I feel SO blessed! But during the time that I was unemployed, my mother-in-law’s health took a turn for the worse. She was in a care facility about 15 minutes away from us, and we were visiting with her almost every day. I started my new job, and just days later at work I got the call that we dreaded. Mom had passed away. Ours is a very small family, so decisions and tasks were placed on just a couple people. To say it was stressful would be an understatement, but we got through it. I presented for two quilt guilds over the past two months, and what a joy that was! The C.A.M.E.O. Quilt Guild in Clawson is such a great group of quilters! Not only did I do a presentation, but I taught two hand quilting classes to them as well. Lots of fun! I also did a presentation for my own quilt guild, the Evening Star Quilters in Davison, Michigan. Fun, fun, fun! So what am I doing now as a quilter? Hmmm. Hand quilting. I am still working on my Feathered Star quilt, and making good progress. However, it is slow going, as I am quilting diagonal lines across the entire quilt which are about one-quarter of an inch apart. Yes, slow going. 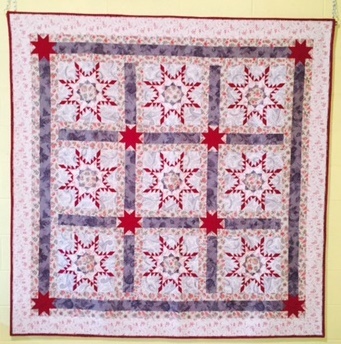 Here is a photo of the quilt taken by Anna Palmer from my presentation at the Evening Star Quilters. I gave them a sneak peak because I have been working on this for so long and don’t really have much else to share during our show-and-tell sessions! Yes, that is my arm in there pointing to the stitching. I made a quilt top for my hand quilting students to work with. It’s a simple 60 inch square Amish-looking Center Diamond quilt in grey, plumb, purple and green. I know, strange colors to put together. But I think it will look good when it is finished. The photo shows it prior to any quilting. I am now hand quilting it in my hoop using black thread, in-between sessions of quilting my Feathered Star quilt. Perhaps I will give you a sneak peek of the quilting on this quilt in my next post. NOTE: The colors on this quilt don’t look right in the photo. The center is lime green, not yellow. What are YOU working on? Please share when you leave a comment below! I’d love to hear from you! Glad to see you back blogging. I just went thru and cleaned up my bloglovin and came across your blog and wondered why you hadn't blogged lately. Life is like that sometimes, and I am so sorry to hear of the loss of your mil. Your feathered star quilt is looking great! I want to start an Amish quilt next summer and have started doing the research on which pattern I would like to do. I am thinking sunshine and shadow, but only time will tell. Can't wait to see what that black thread will look like on your quilt. Sorry for your loss. Hugs. I'm enjoying a warm fire and the time to catch up on some blogs I enjoy. It's so good to see you posting again, and I'm sorry to hear there were good reasons why you couldn't! Just want to tell you how much we enjoyed your presentation at CAMEO. I've been using some of the John James needles after I tried them at the workshop – they are WAY better than what I was using, and that alone was worth coming that morning!